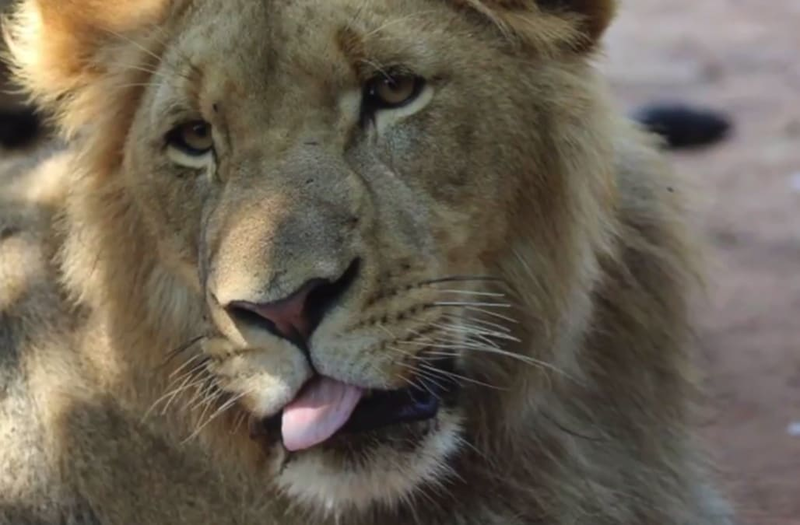 Three male lions were decapitated and had their paws chopped off at a wildlife park in South Africa. The tragic attack occurred at Letaba River Lodge in Limpopo, which is close to the border of Zimbabwe and Mozambique. Police say that poachers cut through the lodge's fences and fed the lions poisoned meat before killing them. The gruesome killing is believed to be used in black magic according to South Africa's Occult Crimes Unit. This is the second such attack that lodge owner, Andre de Lange has suffered. There are less than 20,000 lions left in the wild with many countries using them for witchcraft and medicinal purposes. Handout photo of the mountain lion known as P-35 eating a kill in the Santa Susana Mountains in Southern California in this December 4, 2015 handout photo released to Reuters April 6, 2016. REUTERS/Jeff Sikich/National Parks Service/Handout via ReutersATTENTION EDITORS - THIS PICTURE WAS PROVIDED BY A THIRD PARTY. REUTERS IS UNABLE TO INDEPENDENTLY VERIFY THE AUTHENTICITY, CONTENT, LOCATION OR DATE OF THIS IMAGE. FOR EDITORIAL USE ONLY. NOT FOR SALE FOR MARKETING OR ADVERTISING CAMPAIGNS. THIS PICTURE WAS PROCESSED BY REUTERS TO ENHANCE QUALITY. AN UNPROCESSED VERSION HAS BEEN PROVIDED SEPARATELY. A black bear and its cub are shown near a kill made by a mountain lion known as P-35 in the Santa Susana Mountains in Southern California in this December 7, 2015 handout photo released to Reuters April 6, 2016. REUTERS/Jeff Sikich/National Parks Service/Handout via ReutersATTENTION EDITORS - THIS PICTURE WAS PROVIDED BY A THIRD PARTY. REUTERS IS UNABLE TO INDEPENDENTLY VERIFY THE AUTHENTICITY, CONTENT, LOCATION OR DATE OF THIS IMAGE. FOR EDITORIAL USE ONLY. NOT FOR SALE FOR MARKETING OR ADVERTISING CAMPAIGNS. THIS PICTURE WAS PROCESSED BY REUTERS TO ENHANCE QUALITY. AN UNPROCESSED VERSION HAS BEEN PROVIDED SEPARATELY. A black bear is shown near a kill made by a mountain lion known as P-35 in the Santa Susana Mountains in Southern California in this December 7, 2015 handout photo released to Reuters April 6, 2016. REUTERS/Jeff Sikich/National Parks Service/Handout via ReutersATTENTION EDITORS - THIS PICTURE WAS PROVIDED BY A THIRD PARTY. REUTERS IS UNABLE TO INDEPENDENTLY VERIFY THE AUTHENTICITY, CONTENT, LOCATION OR DATE OF THIS IMAGE. FOR EDITORIAL USE ONLY. NOT FOR SALE FOR MARKETING OR ADVERTISING CAMPAIGNS. THIS PICTURE WAS PROCESSED BY REUTERS TO ENHANCE QUALITY. AN UNPROCESSED VERSION HAS BEEN PROVIDED SEPARATELY.